Have you ever considered writing in a font that mimics your favorite artist’s handwriting? No? Well, now you can anyway. A website creatively named ‘Songwriters Fonts‘ hosts free typefaces modelled after legendary musicians. So far these include the scrawls of Kurt Cobain, David Bowie, John Lennon, Leonard Cohen, and Serge Gainsbourg. They all happen to be dead, which probably helps avoid legal skirmishes. On the other hand, it has a weird vibe somewhat like other posthumous likenesses – hologram Tupac comes to mind. At least the designers aren’t making money off it. Write songs as the ones who inspired you before. The Songwriters fonts have been created to give musicians inspiration. Writing lyrics with the handwriting of influential songwriters helps imagination to develop. Being in the mood of Bowie, Cobain, Cohen, Gainsbourg, Lennon, might be purely imaginative… but that’s precisely the point. A font modeled after Leonard Cohen’s scribbles. I mean, I’m not quite sure a font has the power to make me write lyrics like John Lennon on acid, but they’re still pretty cool. 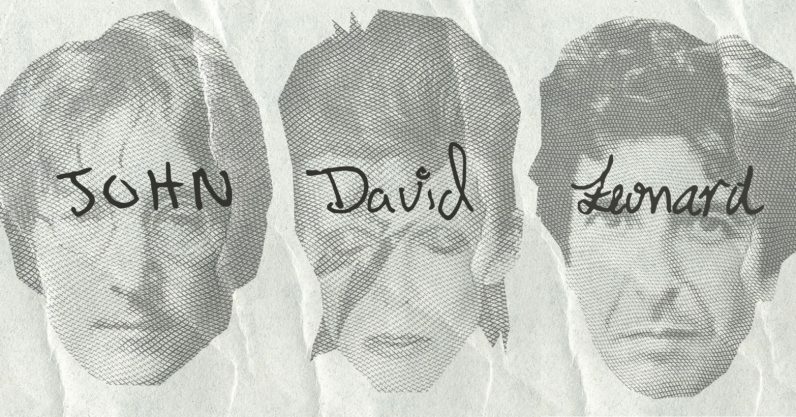 I’m particularly fond of Cohen’s poetic-looking scrypt and Bowie’s bubbly handwriting. Somehow, the fonts seem to fit each artist’s persona – which apparently is a real thing. The site notes that the fonts samples are only meant for personal use, so don’t go using them fonts for a giant billboard. But if you want to install them to get real creative next time you write a rock opera in Microsoft Word, here are some guides on how to install fonts on Windows and Mac. You can download the fonts themselves from the source link below.